Hi, and thank you for venturing here! 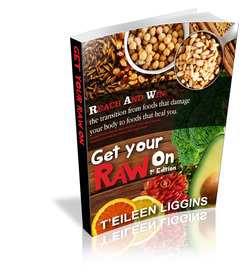 Here’s a little background on my book, Get Your RAW On! I am very excited about this book I’ve written about my new way of eating. I started journaling when I first went “raw” because journaling comes so natural to me. I like to capture experiences in my life that I would otherwise have no way of remembering later down the road. One such experience of mine was a heart attack I suffered at age 40. Talk about a wake-up call! Following six months of tests, scans, biopsies, and 15 different medications prescribed by three different medical specialists, the diagnosis slapped on my condition was sarcoidosis. It is an auto-immune disorder that affects the tissue anywhere it choses in the body. For me, it was the tissue (lymph nodes) in my lungs. At that point, I began improving my diet, knowing that my lifestyle of hard work, little sleep, and poor eating habits–all while playing the roles of wife, mother, employee, family organizer-and-everything-elser–contributed to that situation. I researched a lot and grew passionate about helping people to become more aware of their health. I used my faith to declare my healing and to learn the right steps to take. I refused to take anymore medications and surprisingly (or not) my symptoms began clearing. I did my best to modify my diet–eliminating red meat, starches and quite a bit of sugar. However, my findings were limited (at least my findings on the truth about foods) and sarcoidosis showed its ugly head every now and then because I continued to eat pretty bad (but delicious!) foods. Over the course of 12 years, I still suffered symptoms of shortness of breath, sharp chest pains, swollen ankles and other minor nuances from time to time. I was intrigued by the facts shared with me by award-winning raw food chef, Chef Keidi Awadu, about how certain foods plain and simply destroy our bodies. I was never a vegetarian or a vegan and here I was learning about something that was on a more advanced hierarchy of eating than those two. I knew I didn’t have time to waste if I wanted to achieve optimum health once and for all. So raw it was for me! That meant eliminating foods that are cooked–as in fried, baked, broiled, boiled, bbq’d, sauteed, nuked, steamed, wok’ed, or otherwise. That meant getting rid of my microwave. What??? I never thought I could change my way of eating that drastically, but I did. I drew a line in the sand and never looked back. My health has never been better, perhaps in ALL my life (because I was a pretty sickly child)! Instead of continuing to answer these same questions for a few people, I decided to put it all in a book so that the information can help many. The book is not quite finished, but I’ve started marketing it now. Many of you have been asking about it for so long that I didn’t want you to think I was never going to complete it (it’s just that unfortunately, my own books take a backseat my client’s books that I write). So, please order Get Your RAW On! NOW and be a little patient until it arrives in your hands. I appreciate YOU so much! Just as 3John2 states in the Bible, would love to see you prosper in your body, as your soul (mind) prospers. So, just what causes food to be cancer causing? Those of us who are health advocates speak often about the foods that are problematic and disease causing. Why talk about it until we’re blue in the face? I can only speak for myself when I say I do so because it pains me to see people suffering with chronic illness, disease, dangerous medical treatments and such, when most don’t have a clue how close they are to correcting all that. The answer, or antidote, is as close as their pantry, their refrigerator, their stove, their microwave, their crock pot and their barbeque pit! So here’s the deal. I know that sometimes all this health talk is so overwhelming that the best thing to do is ignore it all with the copout phrase, “We’re all going to die of something anyway.” Yeah, that’s true, but unfortunately what happens more often is that your death from bad food habits doesn’t occur until after you’ve spent hundreds of thousands of dollars to try and get well. That whole phenomenon is a puzzling thing… If people are so content to die from their bad food intake, why then do they spend their life’s savings AND potentially their heirs’ money trying to fix what they messed up? So, here’s how I think is a better way to look at it (at least it helped me go from SAD [Std Amer Diet] to RAW instantly). Rather than get hung up on the title: foods that cause cancer (as it’s usually stated), you must be mindful of what cancer-causing additives, chemicals and other ingredients are placed in your foods. That’s where you’ll be able to start making wise choices. For instance, you can have a nice healthy plate of vegetables that are good for your body turn into a cancer risk simply because of how they are prepared. Food additives and chemicals are used for various reasons: to enhance taste, for appearance purposes, or to increase product shelf life. The key to avoiding cancer-causing foods is to know which ingredients are carcinogens, another name for cancer promoters. That means reading up on the latest reports about healthy eating and reading your food labels before purchasing. 1. Casein – the milk-derived “glue” found in commercial chocolate. To stay well, you don’t have to give up your chocolate treats, just eat them in a more natural state. In our household, we eat lots of decadent chocolate deserts that are prepared the natural, cancer-free way. 2. Acrylamides – these are not added into your food; they are created during the baking or frying process. Acrylamide forms when starchy foods are subjected to high heat. The best example of this is that favorite dish of many: mac & cheese. Especially toxic is the crusty parts that form during baking—you know, where it sticks to the glass dish and you have to scrub real hard to clean it and some of it still never comes off. Eating all that cheese is problematic enough, but please avoid eating the crusty, burnt-ish parts. Another incubator for acrylamides is the summer favorite: the barbeque grill. Sure, that crunchy, slightly burnt chicken skin is the best part of the bbq’d chicken. It’s also lethal! If you must eat your chicken, at least throw away that skin first! Com’on you can do it! By the way, don’t mess up the great attributes of vegetables by blackening them on the barbie also. If you must have shishkabobs, just a few minutes on the grill is plenty—in fact, what’s wrong with eating them raw on the stick? Hmm, what a novel idea. During the digestion process, sodium nitrite is converted to nitrosamine, which causes the cancer risk. Nitrosamine is not technically an ingredient, so you may not find it listed on the packaging. Nitrosamines are in foods that are pickled, fried, or smoked– that’s notably beer, cheese, fish byproducts, and tobacco smoke. 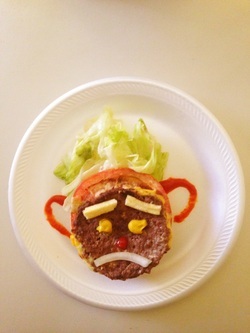 Hot dogs: even the Cancer Prevention Coalition recommends limiting the number of hot dogs a child should not eat. How nice of them (Not! If they really cared about your child’s welfare, they’d tell you to give them ZERO hotdogs!). Nevertheless, if you gotta have ’em, buy the ones without sodium nitrite. Processed meats and bacon: You can buy the ones without nitrites, but bacon of any sort is bad. 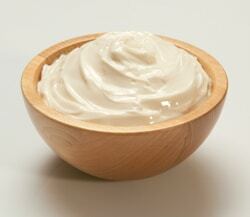 It is also high in saturated fat, which contributes to the risk of cancers as well, including breast cancer. 4. Hydrogenated oils – when you mix these oils with heat, you are creating the worse cancer foods you could ever create! So, there’s no way around this one—stop frying your foods!! Among of the worst foods prepared with hydrogenated oils are doughnuts and French fries. Along with containing this dangerous substance, doughnuts also have white flour, sugar, AND acrylamides. Yikes! Reader’s Digest calls doughnuts American’s disastrous breakfast food. It’s best to just say bye-bye to Dunkin’ and Krispy. If you must have your taters, bake them. Fries made with hydrogenated oils then mixed with the high temperatures create that deadly acrylamide. Bottom line, you’re adding acrylic to your arteries. Enough said! Chips, crackers and cookies all contain white flour, sugar as well as the fats. Their ingredients are very strategically masked on their labels. Manufacturers put all kinds of bad things in there. These items likely have GMOs (genetically modified organisms) as well. An explanation of GMOs and their dangers will take up a whole other blog! For now, google all you can about them and intelligently avoid them at all cost! The World Health Organization states that 70 percent of all cancers can be prevented with simple changes to diet and lifestyle. Preventing cancer is quite easy once you know what to look for. With the right information, and a willingness to be smart about food preparation choices, we can see a major improvement with our nation’s health crisis—and with the crisis going on right in your home.